Figure 1 . Gas-liquid chromatography can separate the components of tiny amounts of an unknown mixture. A sample of the molecule (1) is injected (2) into a stream of helium (3), or another inert gas. Heating ensures the vaporized gas mixes fully with the helium. After impurities are removed (4) the gas mixture passes into a tube (5) packed with coated granules of silicon (6). A liquid with a very high boiling point (7) covers the 4mm (0.15in) granules. The components of the vaporized have different solubilities (8) and so pass through the liquid around the silicon, and the whole tube, at different speeds. The whole tube is kept at a high temperature to prevent the vaporized gas condensing. As the now-separated parts of the mixture exit the tube (9) they enter a detector (10). Hydrogen (11) and oxygen (12) are added and the gas stream is then burnt (13). During burning, each compound produces ions that pass a charge between an anode (14) and a cathode (15). This charge is measured and can be compared to known results to determine the composition of the initial mixture. Chromatography is a versatile technique of chemical separation and chemical analysis, capable of dealing with many-component mixtures, and large or small amounts. Invented, in its original form, in 1906 by the Russian botanist Mikhail Tsvett (1872–1920), it is used extensively in organic chemistry and biochemistry. The name chromatography comes from early methods of identifying separated components by their color, but many colorless compounds are now identified using the technique. The sample is injected into the moving phase, a gas or liquid stream which flows over the stationary phase, a porous solid or a solid support coated with a liquid. The various components of the sample are adsorbed (see adsorption) by the stationary phase at different rates, and separation occurs. Each component has a characteristic velocity relative to that of the solvent, and so can be identified. There are two main types of chromatography: liquid-solid and gas-liquid. In this, the solid is packed into a tube, the sample is added at the top, and a liquid eluant is allowed to flow through; the different fractions of effluent are collected. A variation of this method is ion-exchange chromatography, in which the solid is an ion-exchange resin from which the ions in the sample are displaced at various rates by the acid eluant. Other related techniques are paper chromatography (with an adsorbent paper stationary phase) and thin-layer chromatography (using a layer of solid adsorbent on a glass plate). Mixtures of compounds can be separated by gas chromatography. Gaseous molecules travel down columns of liquid-impregnated solids at different rates. Special detectors reproduce on a graph the peaks produced by the molecules as they leave the column. Each can frequently be identified by the time it takes to go through the column – the "retention" time. The chromatogram shows the separation of hydrocarbons: isobutene (A), n-butane (B), n-butene (C), isobutene (D) trans-but-2-ene (E), cis-but-2-ene (F), cis-1-3-butadiene (G). 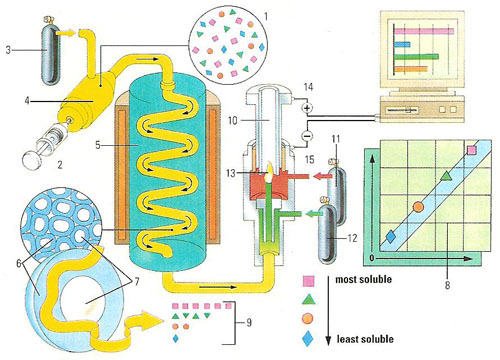 Gas chromatography is a type of chromatography in which the carrier medium is a gas. The technique is used for analyzing or separating a mixture of gases, often derived from a heated liquid mixture. A *carrier" gas (the mobile phase) – often hydrogen – sweeps the mixture around a very long coiled tube containing the stationary phase, which differentially absorbs the components of the mixture. In gas-liquid chromatography (GLC), the stationary phase is a liquid such as a non-volatile oil coating a solid support. This is the most sensitive type of chromatography (see Figure 1). In it, a small vaporized sample is injected into a stream of inert eluant gas (usually nitrogen) flowing through a column containing nonvolatile liquid adsorbed on a powdered solid. The components are detected by such means as measuring the change in thermal conductivity of the effluent gas. In setting up an experiment in gas chromatography, or troubleshooting, it is important to be able measure gas flows. This can be done using an instrument such as a bubble flowmeters or thermal mass flowmeters. 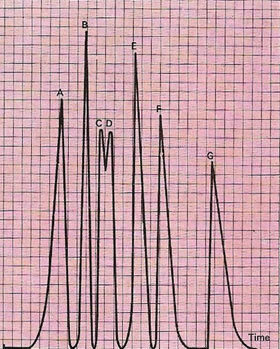 In gas-solid chromatography (GSC) the stationary phase is a solid such as kieselguhr (diatomite). The components of the mixture are detected as they leave the apparatus in turn or, if the chromatograph has been calibrated with known substances, they are identified by the time they take to pass through. This method of chromatography is used to analyze tiny amounts of a sample. Thin-layer chromatography represents a method of quickly and accurately separating the components of a mixture (see Figure 2). 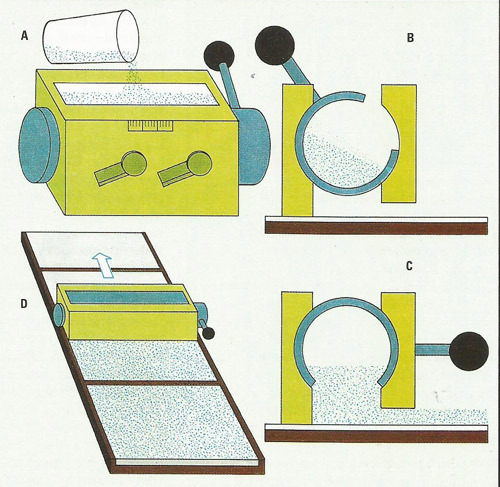 It is carried out using slurries of finely divided adsorbants, such as silica gel or kieselguhr, applied to glass plates or plastic sheets in a thin, uniform layer by a spreading procedure, usually with the aid of a commercial applicator as shown in (A). The applicator consists of a hollow metal block with exit gates on each of two opposite long faces. A section through the applicator (B) shows how the internal, rotating reservoir chamber, with a wide longitudinal slot, fits into this block. Flow of the suspension does not begin until the chamber is rotated to its open position (C). Simultaneously, the applicator is pulled across a series of plates laid out on a mounting board (D). The applicator is self-adjusting to the surface of the plates because it rides on the plate during the costing procedure.